Bates College will build new residence halls on Campus Avenue as the first step of a Campus Life Project intended to establish a dynamic center of college life on the south side of campus, Bates President Clayton Spencer announced today. In addition to new student housing, the Campus Life Project will transform Chase Hall into a contemporary campus center, relocate the College Store to street-level space in the public eye, and create a more defined and welcoming gateway to Bates on the southeast corner of campus. “The Campus Life Project represents a crucial step forward in our commitment to deliver a highly personal liberal arts education that locates the academic experience in a residential community,” said Bates President Clayton Spencer. Design on the residential halls is underway. An ambitious building schedule calls for groundbreaking in September 2014 and opening the new buildings for students in fall 2016. 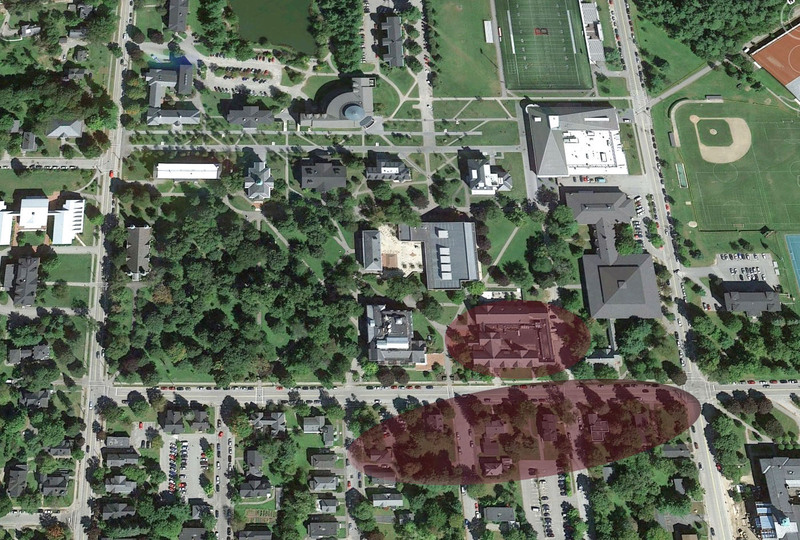 College offices now housed in wood-frame buildings on and near Campus Avenue will be relocated beginning in June. The project will be funded through a combination of tax-exempt financing and significant college fundraising, including naming opportunities at a variety of levels. The Campus Life Project builds on the work of the Campus Facilities Master Plan, first developed in 2004 and updated in 2010 to guide the physical development of the Bates campus and support broader strategic planning decisions. The initiative is overseen by the Campus Facilities Master Plan Steering Committee and a project advisory committee, both comprising students, faculty and staff who represent a broad array of functions and expertise across campus. The Campus Life Project’s various elements, including landscaping and signage, will turn a few blocks of Campus Avenue into a lively center of Bates life. The college has retained Ann Beha Architects, a Boston–based planning and design firm, as project architect. Ann Beha and her team have extensive experience in designing signature buildings for colleges and universities, as well as other cultural institutions. Chris Streifel of Bates Facility Services will serve as project manager. The Campus Life Project’s various elements, including landscaping and signage, will turn a few blocks of Campus Avenue into a lively center of Bates life, and “will renew and extend Bates’ identity and resources along Campus Avenue, while establishing a vibrant campus gateway and a hub for community activity,” architect Beha said. New residence halls continue the college’s strategic plan to improve student housing by reducing the density of beds in other residences. The first part of the Campus Life Project is the design and construction of a suite of new buildings on college-owned property on Campus Avenue, across from Carnegie Science Hall, Chase Hall and Muskie Archives. In addition to residential space for more than 200 students, new spaces will be created for the College Store (currently located in a lower level of Chase Hall), office services and other administrative functions. The addition of new residence halls continues the college’s strategic plan to improve student housing by reducing the density of beds in other residences, including Smith Hall. With no plans to increase the size of the student body, Bates will remain at its current enrollment of approximately 1,750 students on campus and 250 studying abroad. Following completion of new construction on Campus Avenue, Bates will undertake a comprehensive reimagining and expansion of Chase Hall to serve as the hub of campus life. The restoration will incorporate contemporary architectural elements while preserving those components of Chase Hall that are historically significant, said architect Beha. Once renovated, Chase will offer gathering spaces for Bates students, faculty, staff and alumni while also making a striking first impression for prospective students visiting campus. Housing student-facing administrative offices as well as spaces for student organizations, the building will be lively at all hours of the day and night. “Our goal is to complete the reclamation of Chase Hall for today and to place this beloved building front and center as a hub of Bates campus life,” Spencer said. A historic campus landmark dedicated in 1919 as a social center for men, Chase Hall quickly evolved into an all-student gathering place. It has long provided a wide variety of spaces: offices for student organizations; venues for social events (it was where Bates men and women first danced together, in 1922); and, until a new facility was opened in 2008, the college’s dining Commons. Chase has undergone a number of additions and renovations over the decades, the most recent in 2012. Supported by generous alumni and parents, Bates made significant improvements to the lobby, Bobcat Den and Chase Lounge, and created meeting space for the Bates Outing Club. From June through August, the college will relocate several offices now housed in wood-frame buildings on and near Campus Avenue. They include the Bates Career Development Center, the Bates Communications Office and the Office of Intercultural Education as well as some student organizations. Their current buildings will be razed. The college’s contemporary planning process dates to 2004 and the approval of a Campus Facilities Master Plan. The plan provided strategic guidance for several construction projects, including the cross-campus Alumni Walk, a student residence at 280 College St. and the Commons dining facility, plus a major restoration of the Gomes Chapel and the expansion of Hedge Hall and Roger Williams as academic centers. The current round of projects outlined in the updated Master Plan was authorized in October 2013 by the college’s Board of Trustees, which voted unanimously to approve a project recommendation from the Campus Facility Master Plan Committee.